Keyterms: Population Geography, urbanization, deindustrialization, out-migration, white-flight, redlining, push factors, Urban Geography, Economic Geography, Development, Blight, Industry, Manufacturing, secondary economic activity. In just five decades, the city’s population dropped from nearly 100,000 in the 1960s to fewer than 52,000 by the 2010 census. To say it another way, Saginaw lost 48 percent of its residents during the last 50 years. The reasons for the decline are many, and the impact of the outbound migration is still felt today. This week, The Saginaw News takes a look at those trends through the eyes of those who once lived in the city, and some who still do today. The series of reports titled “I used to live here” talks to citizens about what they’ve witnessed during the past few decades in the neighborhoods they’ve called home. Betty Van Ochten tells how her North Side neighborhood disappeared under the asphalt of a new, wider Washington Avenue. Donald and Barbara Anderson reflect on 42 years of living in the city they call home. Linda Parent tells about her childhood in a neighborhood near the old Saginaw County Fairgrounds. Former Midland residents Beau and Teagan Carnes reflect on their first five years living in Saginaw’s Houghton-Jones neighborhood. Eddie Byas discusses how he hardly recognizes the Buena Vista Township home where he raised his family. Experts also weigh in on what happened and what the future may hold for the city as it reshapes itself for the new century. Long before Saginaw’s decline came a period of unfettered growth, from a city of about 50,000 people in 1910 to its population height in 1960. In 1968, Saginaw was one of the 10 cities chosen as an “All-America City” by the National Civic League. Former Saginaw mayor and history buff Greg Branch said similar growth was seen across the nation. Evelyn Ravuri, a professor of geography at Saginaw Valley State University, specializes in a field called “population geography,” which focuses on the distribution, composition, migration and growth of populations. Ravuri said Saginaw’s more recent population decline, like its growth, is by no means unique to this city. Ravuri said a migration also took place from metropolitan areas across the nation: A departure of baby boomers from cities and into surrounding suburbs. According to the U.S. Census Bureau, in 1950, 61 percent of the residents in Saginaw County lived in cities, with about 39 percent in townships and villages. Sixty years later, the opposite is true. While 29 percent of Saginaw County residents still lived in cities in 2010, the vast majority (71 percent) live in outlying townships and villages. Cities in Saginaw County are the cities of Saginaw, Frankenmuth and Zilwaukee. “Population spread” into outlying areas hit places like Saginaw harder than large metropolitan areas, such as Boston and San Francisco, because of the availability of undeveloped rural land close to Saginaw’s city center, Ravuri explained. “It wasn’t so much people running away as it was they had tremendous incentives to move away,” Branch said. He explained that the now-illegal process of “redlining” certain neighborhoods to discourage investment was, at the time, both legal and commonplace. At the same time, Branch said, attractive loans were available to some who were interested in moving into the suburban developments popping up outside city limits. The start of the departure of residents from Saginaw, Branch said, can be blamed on those incentives, coupled with racial tensions reaching a crescendo in the 1960s and the bisection of Saginaw by the construction of Interstate 675. “You have this huge swath of land cutting right through the main part of the city,” Branch said. “My dad’s stepmother, my grandfather’s widow, lived in a house on North Michigan in the last block before Weiss. The berm for 675 is where their yard was. They bought her house, and what did she do? She moved out to the township. And a lot of people did that. 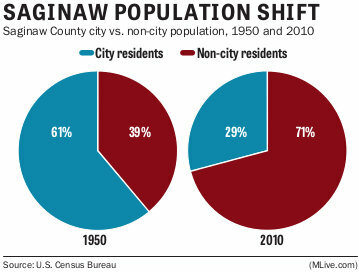 While the city of Saginaw’s population has plummeted since 1960. During the same period, the population of neighboring Saginaw Township has doubled. Construction of the nearly 8-mile-long interstate business route began in 1969 and it was opened to traffic in 1971. Branch also acknowledged the city’s failure to annex portions of the surrounding townships as the population spread. The city sold those areas its water. The problem eventually began to snowball, depressing real estate values and causing more residents to leave, Branch said. Saginaw County’s countywide population grew steadily to a height of 228,000 in 1980 and has since seen a trickle of decline. The county population in 2010 was about 200,000. At the same time that the city of Saginaw rapidly lost residents, many of the surrounding townships were growing. 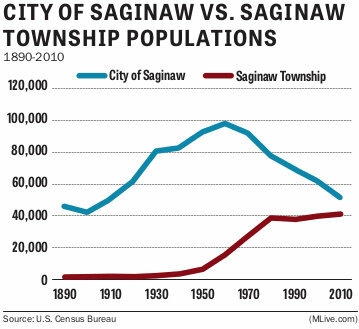 Saginaw Township expanded from a population of just under 6,000 in 1950 to 40,840 in 2010. That means the township now has only about less 10,000 residents than the city. Thomas Township has also seen huge growth in the last 60 years, from a population under 3,000 to one of nearly 12,000. Tittabawassee Township has grown from a population of nearly 2,400 in 1950 to nearly 10,000 residents at the time of the last census. Bridgeport Township has nearly doubled in size since 1950, from about 5,500 to about 10,000. The migration from city to suburbs has had financial consequences for Saginaw, including significant implications on the city’s ability to provide services and maintain infrastructure. The total assessed value of the city’s taxable property has fallen from nearly $760 million in 2002 to about $610 million in 2011, roughly a 20 percent decrease. Saginaw’s city government has downsized, staffing 345 full-time and 88 part-time positions in the current fiscal year. Five years ago, the city had 466 full-time workers. But it’s not all bad news for a city full of people with a passion for their hometown and its rich heritage as both an important supplier of lumber and as an industrial and manufacturing hub. Festival goers at the Michigan Rock ‘n Rib Fest in 2013 at FirstMerit Bank Event Park in Saginaw. Unlike many Midwest cities that invested heavily in the automotive industry, Saginaw’s city government has not yet approached the edge of bankruptcy. Though Saginaw’s expenses are rising and its savings dwindling, city leaders still make final administrative and budgetary decisions, unlike its neighbors along the Interstate 75 corridor that are run by a state-appointed emergency manager. With a brand new outdoor event venue built in downtown Saginaw in 2013, new residential housing being developed in the city and the prospect of a Central Michigan University Medical School campus on both sides of the Saginaw River opening in 2015, many watching the news are hopeful a new era of growth lies ahead. Ravuri said that some experts are predicting a revival of metropolitan areas, though she pointed out that it’s unclear if that growth trend might appear in Saginaw. A crew from Rohde Brothers Excavating tears down a house at 3145 S. Washington in Saginaw, Dec. 11, 2013. City and county leaders are attempting to make room for potential growth and to stabilize remaining neighborhoods. Hundreds of vacant, blighted properties dot Saginaw. Thanks to $11.2 million in federal grant dollars secured in 2013, officials plan to demolish about 950 of the empty, dilapidated homes. That amounts to about 5 percent of all of the houses in Saginaw. City officials estimate there are another 1,000 blighted homes that still should be demolished. Follow along and jump into the conversation yourself on Twitter using the hashtag #iusedtolivehere. Use our searchable database below to explore information on the county-owned properties already slated for demolition as part of the federal grant. Crews have already begun demolishing some of the 413 publicly-owned properties in the database and hope to acquire another 500-some privately-owned empty, blighted homes to demolish. The plan is to clear all 950 properties by the spring or summer of 2015.